Today, we look at another old favourite of the flavoured-gin world and one of the easiest to make at home. I previously visited this last year when I made some Autumnal Gin with Sipsmith. To make this at home, simply steep some chopped ginger root in a gin of your choice for about a week, or to taste. I use about one cup of ginger for each litre of gin. Nose: Juniper, wood, butter, and ginger. Taste: This seemed quite perfumed, with some ginger towards the end. The balance of the spirit seemed slightly off and, to be honest, it was not that pleasant a drink on its own. Quite nice and very smooth; spicy, with some creamy notes, but – overall – quite a clean taste. A very odd drink, which reminded me a lot of alcoholic ginger beer, although there was definitely some juniper towards the end. Sadly, I thought that this drink would have a bit more intensity and pizazz. Using Fentimans Tonic way well sort this out, giving the drink a zesty boost of lemongrass. Ginger was the predominant flavour, but it had an interesting, malty quality to it, too. There was some fire, but this was quite modest towards the end. Some sweet vanilla and coconut notes, too. OK, but the ginger seems to be very easily lost. Lots of room for improvement. This works and works well. It’s like a usual Negroni, with the bittersweet balance and dry juniper, with the addition of some spicy fire from the ginger. It’s a warmer Negroni and one that’s packed full of flavour; very nice. I wasn’t quite happy with the unsweetened version of this gin, so I thought I’d add a little sugar, as was the custom with cordial gins of times past. The result was quite pleasant, although more like a ginger liqueur than a gin. The sugar also brought out some other spice notes, with a pleasant fire at the end. In the end, I think that Ginger Gin has potential, but my recipe needs tweaking. I found that, once bottled, the gin starts to lose some of its flavour, so a longer/more intense steeping program is needed. I think that some additional citrus peel would make the flavour a bit sharper, too. The other potential route to go down would be to try making more of a cordial gin or liqueur. If I was trying this, I would add brown sugar, spices and maybe some orange. Of course, the other – and, in my opinion, the best – alternative would be to try both! I’ll keep you updated with the results of my experiments. 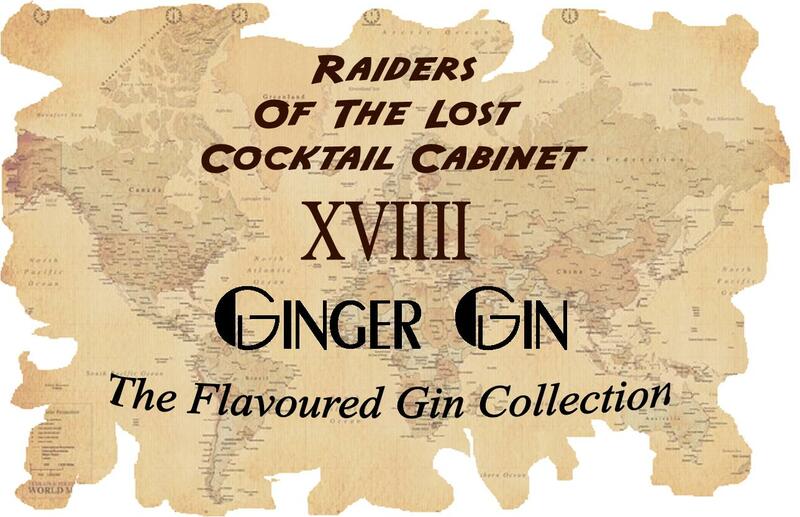 This entry was posted in Raiders of The Lost Cocktail Cabinet and tagged flavoured gin, ginger gin, raiders of the lost cocktail cabinet by DTS. Bookmark the permalink.